A star lineman on offense and defense, Michaels also served as a kicking specialist for seven teams: two high school, one college and four professional. A left-footed kicker, he did it all: kickoffs, extra points, field goals and punting. The native of northeastern Pennsylvania was a two-time All American (1956, 1957) at Kentucky, and was the only lineman (until 1966) named conference MVP. Michaels excelled as a three-way performer for 13 years in the NFL on four different teams: Los Angeles Rams, Pittsburgh, Green Bay and Baltimore Colts, where he enjoyed his greatest success for six seasons (1964-1969). He finished his career with 955 points, all but eight coming off his left toe (he scored a touchdown with an intercepted pass and sacked a QB for a safety). He was named All-Pro in 1962 and 1963 and played on the Colts’ 1969 squad against the New York Jets in the Super Bowl. He was elected into the National Collegiate Football Hall of Fame in 1992. They don’t make football players like Lou Michaels anymore. The 6′-2″, 250-pound lineman was a star on both offense and defense and also served seven teams-two high school, one college and four professional teams-as a kicking specialist. A left-footed kicker, Michaels did everything kickoffs, extra points, field goals and he even punted during his illustrious career. Not bad for a tough Polish kid who was raised in northeastern Pennsylvania, the youngest of eight children born to Walter and Mary Majka. Louis Andrew (Majka) Michaels still lives in his hometown of Swoyerville, a tiny suburb of Wilkes-Barre. Lou’s athletic career took off at Swoyerville High School, where he lettered in three sports – football, baseball and basketball – as a freshman and sophomore. His teams won league championships in all three sports. Because he also excelled in the classroom, Michaels was tapped to attend the prestigious Staunton Military Academy in Virginia. At Staunton he picked up a fourth sport – track – and became the school’s first four-sports letterman. However, football was his best sport and he earned All-State honors in both his junior and senior seasons. College scholarships were plentiful and Michaels decided to go south and play for the University of Kentucky in the tough Southeastern Conference. It was a wise decision as he had a great four-year (1954-57) career for the Wildcats. Back in those days, freshmen were not eligible for varsity play, so Kentucky had to wait a year for Michaels to make his contribution. And did he ever; playing both offensive and defensive tackle, a little linebacker and again, all the kicking chores. Michaels was a consensus All-American in both 1956 and 1957 when only 11 players were picked first team. “The Pennsylvania Pole” took almost every award available, including the Nashville Banner Trophy. He was chosen by a vote of the coaches as the Most Valuable Player in the Southeastern Conference. He was the only lineman singled out for that award during a 26-year span from 1941 to 1966. The Washington, D.C., Touchdown Club also picked him as the nation’s outstanding lineman. The Birmingham Touchdown Club named Michaels the league’s most outstanding lineman in 1956. The Atlanta Touchdown Club accorded him the same honor in 1957. Lou’s talents didn’t go unrecognized around the country as he finished fourth his senior year in the Heisman Trophy balloting a great finish for a lineman as the Heisman votes normally go to quarterbacks and runners. The National Football League was Lou’s next stop as he was a sure first-round draft pick. The Los Angeles Rams selected him and he stayed around for a remarkable 13 years in the NFL. He finished his career with 955 points, retiring after the 1971 season as the NFL’s fourth all-time leading scorer. All but eight of Michael’s 955 points came off his left toe. He scored his only pro touchdown as a rookie when he tipped an opponent’s pass, intercepted it and rambled five yards into the end zone. The other two non-kicking points were scored in 1965 when he was playing defensive end for the Baltimore Colts and sacked a quarterback in the end zone for a safety. Michaels played for the Rams three seasons (1958-60) and then was traded closer to home. He spent the next three seasons with the Pittsburgh Steelers. He didn’t kick much for Los Angeles, but then became Pittsburgh’s “Golden Toe.” He had his first of six 100-point seasons when he totaled 110 in 1962 on 32 of 33 extra points and 26 of 42 field goals. His field goal total broke Lou Groza’s NFL record. Lou had his greatest success as a member of the Baltimore Colts for six seasons 1964 to 1969. In addition to playing defensive end, he again handled all the placekicking. Michaels kicked five field goals in one game in 1966. In 1969, he helped the Colts get to the Super Bowl, where Joe Namath and the New York Jets upset them 16-7. Michaels was out of football in 1970, but returned the following year to play one season with the Green Bay Packers. During his career he played twice in the Pro Bowl and as a collegian he played in the Hula Bowl, East-West Shrine game and the College All-Star game in Chicago’s Soldier Field. 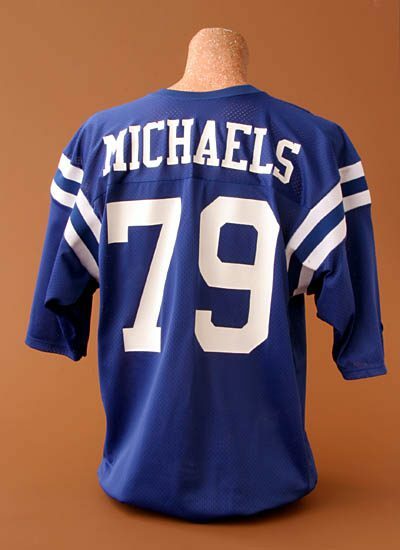 The Baltimore Colts honored Michaels in 1977 by naming him to its All-Time Silver Anniversary team. Being elected into the National Polish-American Sports Hall of Fame is Michaels’ fourth enshrinement in the last five years. He was elected into the Pennsylvania Football Hall of Fame in 1989, the National Collegiate Football Hall in 1992, and in 1993 he was inducted into the State of Kentucky Sports Hall of Fame. Lou still is very active in sports and serves as Athletic Director at the Luzerne County Correctional Facility in Wilkes-Barre. He enjoys golf, hunting and fishing and contributes much of his time to charitable causes. Lou and his wife, the former Judy Mis of Pittsburgh, are very proud of their “100-percent Polish” children. Edward is a high school teacher and football coach, Matthew teaches history and Michele is an accountant. And this is coming from a seasoned coach who spent many years on the sidelines both on the college and professional level. One season Collier had Michaels in for almost every play as he totaled 556 minutes out of a possible 600 in Kentucky’s 10-game schedule. “He was a lot of man and played a lot of football for the Wildcats,” Collier recalled. The veteran coach remembered one game in particular against archrival Tennessee. “We were deep in our own territory and Lou got off a 61-yard punt on the run from the end zone. In addition to that miracle punt, Lou also made 14 solo tackles in that one game. Yes, he did everything for the Blue and White of Kentucky,” Collier said. No wonder they retired his No. 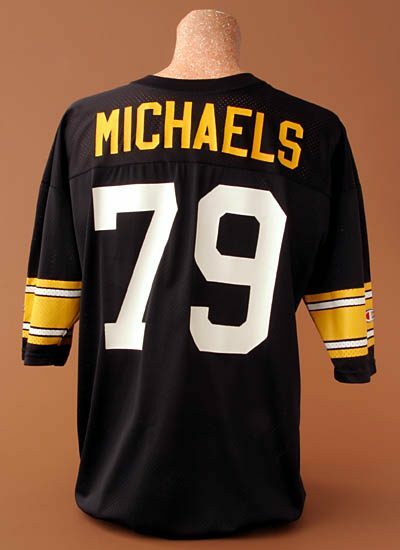 79 jersey when Michaels graduated from the Southeastern Conference school in 1958 and headed to the National Football League.